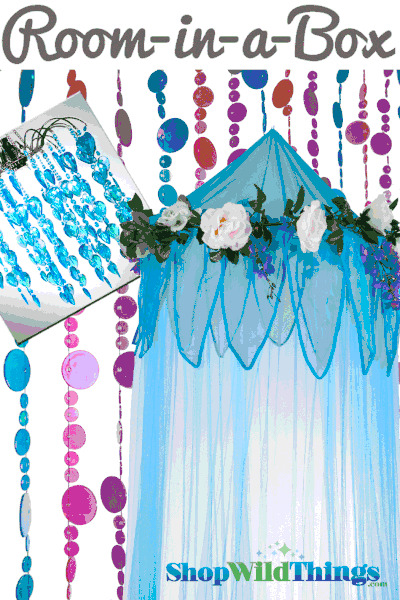 This wonderful Room-In-A-Box includes one of each: "Fairytale" Blue With Flower Garland Canopy, Bubbles "Pony Rainbow" Beaded Curtain and "Fountain" Blue Chandelier. Fairytale Blue Canopy: Yards and yards of luxuriously soft aqua blue mosquito netting fabric flow beautifully from the shiny matching blue solid organza crown that's decked out with beautiful silk flowers! This canopy truly invokes that fairytale feeling. It's fit for royalty! The top of the canopy is solid shiny organza, as are the sweet flaps that look like the leaves of a flower hanging down. The silk flowers are of the highest quality and are a mixture of pink, white/cream and purple with green flowers. 100% Polyester Netting-Blue(#303), top folding metal ring and organza decoration with garland of flowers 2' Ring Diameter, x 8.2' Length, x 39.4' Fabric Circumference. Canopy mounting hardware included. "Pony" Rainbow Beaded Curtain: BUBBLES BUBBLES BUBBLES! We LOVE LOVE LOVE beaded curtains and we love bubbles and we love rainbows and we LOVE this BUBBLE curtain. This curtain comes assembled on one rod and is ready for you to hang it right up in just seconds. Beaded curtains are perfect for doorways, to hang in the windows, to hang flat against walls. Use them as a headboard! 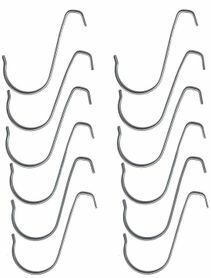 Use them to make your walls look taller and your future brighter! 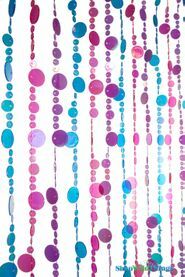 3' x 6' curtain with 27 strands of circles that are acrylic and alternate color and size. Colors are slightly iridescent fuchsia, turquoise and light purple and the circles range from .25" to .5" to 1". "Fountain" Blue Chandelier: The "Fountain" Chandelier does not include a light kit but if you do want an electrical cord that fits this chandelier, please see our Light Cord Kit. The beads are Blue with an Iridescent Coating with also reflects pinkish/purple! The chandelier size is 12" in diameter, 13" Bead Length.